By itself, Google Analytics does a great job of capturing visitor information, aggregating it, and providing helpful information on site performance and traffic. However, as you start to mature in your experience with Google Analytics, you realize that, as a default install, Analytics has some weaknesses in providing deep insights that are unique to your site. Creating your own powerful insights usually requires downloading Google Analytics data and then some offline processing in spreadsheets or databases. Thankfully, Google has improved their toolkit with the addition of Calculated Metrics. Calculated metrics allow you the ability to add your own custom insights and useful metrics right in Google Analytics, and without having to export the data to a third-party program like a spreadsheet or database. What’s more, these insights are viewable in Google Analytics side-by-side with existing system data, allowing you to compare and contrast information, as well as segment data to give the best possible insights. 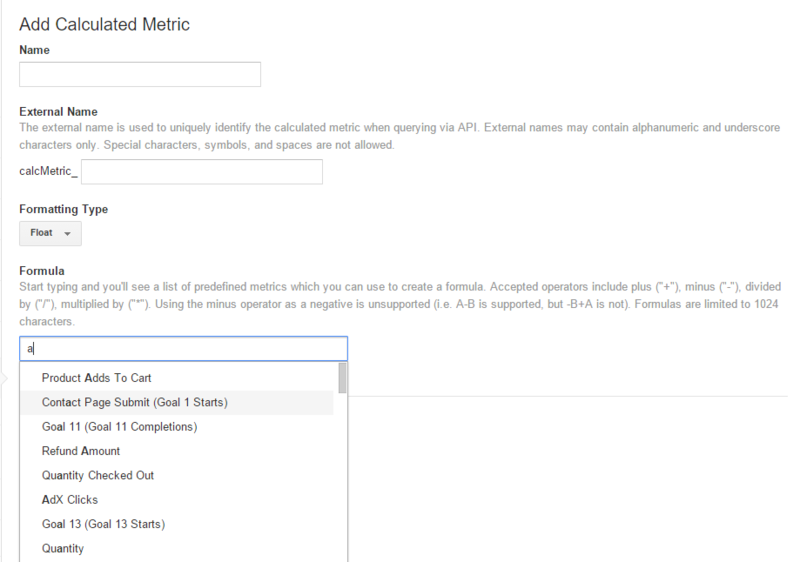 To use Calculated Metrics, click on the Admin portion of Google Analytics and load the Analytics View you wish to use calculated metrics with. Calculated metrics are not defined on the Property level like Custom Metrics, but rather the View level – this means that any view for a defined property will need Calculated Metrics set up. The other “gotcha” is that you can only have 5 calculated metrics per view (unless you have Google Analytics Premium, and then you have 50 calculated metrics per view). I would suppose this is to conserve processing power by Google’s servers. Need more than 5 calculated metrics? Set up another View! an External Name that can allow the data to be called via the Google Analytics Reporting API. This will autopopulate if you prefer from the Name. Formula is where you can enter basic calculations to perform, and they can use parenthesis to perform order of operations. Formulas are limited to 1024 characters. Start typing in this field and it will autofill matching selections. Part of the fun of Calculated Metrics is discovering and learning data that’s unique and useful to your site. Here are some popular and useful calculated metrics to jump-start your discovery. A handy way to see how many Sessions the average User is giving your site. Easy to calculate manually but a useful insight. Somewhat like the Sessions Per User, we can determine the average pageviews a user sees over their trackable history. Taking a spin on the famous Bounce Rate, the Non-Bounce Rate shows the percentage of sessions with more than 1 pageview.